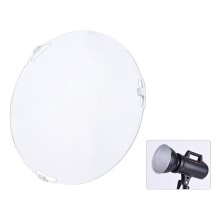 This 18.5cm white diffuser plate is compatible for bowens mount 7" standard reflector. It will make the light output much more natural and softer, perfect for photo studio photography. 18.5cm white diffuser plate compatible for bowens mount 7" standard reflector shade. Made of high-quality material with frosted surface, it can make the light output much more natural and softer. Compact and lightweight design, solid and durable. Perfect for photo studio photography.